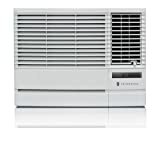 Energy Star Qualified 6,000 BTU Window-Mounted Air Conditioner - Perfect for Mid-Size Rooms Up To 260 Sq. Ft. 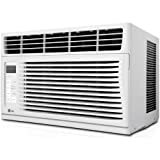 The Haier 6,000 BTU 115V window-mounted air conditioner with mechanical controls is designed for a room up to 250 square feet. Two modes include cool for cooling the air and fan to circulate the air. Choose from 2 cooling speeds (high, medium or low) and 2 fan speeds (high, medium or low). additional features include 2-way air direction to direct the air where you want it and an easy-access washable mesh filter. Plus, the quick install window kit assembles to the unit in minutes for hassle-free installation. 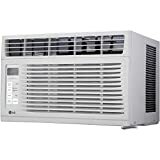 The LG LW6014ER Energy Star 6,000 BTU 115V window-mounted air conditioner is perfect for cooling a room up to 260 square feet. You will cool a lot and save even more with this unit's energy saver function, 24-hour on/off timer and a 11.2 Energy Efficiency Ratio. With its stylish full-function remote control, you can even get your cool on from across the room. Plus, LG's patented Gold Fin anti-corrosion coating provides a protective shield so the unit lasts longer.